Envelop your pout in rich, hydrating colour using Rimmel Moisture Renew Lipstick.The nourishing formula arrives in a collection of vibrant hues and boasts a highly pigmented finish and a recipe containing Vitamins A, C and E and SPF to ensure comfortable and caring wear. 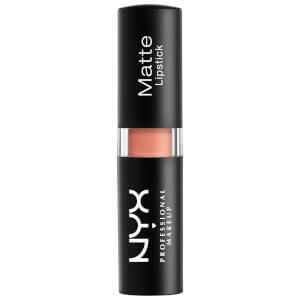 The soft and creamy lipstick applies smoothly to leave behind glossy, ultra-polished results. Apply directly from the tube. Diisopropyl Dimer Dilinoleate, Bis-Diglyceryl Polyacyladipate-2, Di-Ppg-3 Myristyl Ether Adipate, Polyethylene, Tridecyl Trimellitate, Ethylhexyl Methoxycinnamate, Punica Granatum Sterols, C15-19 Alkane, Silica, Vp/Hexadecene Copolymer, Synthetic Fluorphlogopite, Ethylhexyl Salicylate, Microcrystalline Wax, Calcium Aluminum Borosilicate, Ozokerite, Ethylhexyl Palmitate, Caprylyl Glycol, Parfum/Fragrance, Tribehenin, Tocopherol, Behenyl Alcohol, Glyceryl Stearate, Linalool, Ascorbyl Palmitate, Pentaerythrityl Tetraisostearate, Palmitic Acid, Stearic Acid, C12-16 Alcohols, Sorbitan Isostearate, Hydroxycitronellal, Hexyl Cinnamal, Lecithin, Retinyl Palmitate, Tin Oxide, Bht, Silica Dimethyl Silylate, Cinnamyl Alcohol, Geraniol, Butylene Glycol, Palmitoyl Tripeptide-1, Phenoxyethanol, Sodium Chondroitin Sulfate, Atelocollagen, Hexylene Glycol, Sodium Hyaluronate, [May Contain/Peut Contenir/+/-:Mica, Titanium Dioxide (Ci 77891), D&C Red No. 7 Calcium Lake (Ci 15850), Iron Oxides (Ci 77491, Ci 77492, Ci 77499), D&C Red No. 6 Barium Lake (Ci 15850), Fd&C Yellow No. 5 Aluminum Lake (Ci 19140), Fd&C Yellow No. 6 Aluminum Lake (Ci 15985), Iron Oxides (Ci 77499), Carmine (Ci 75470)].